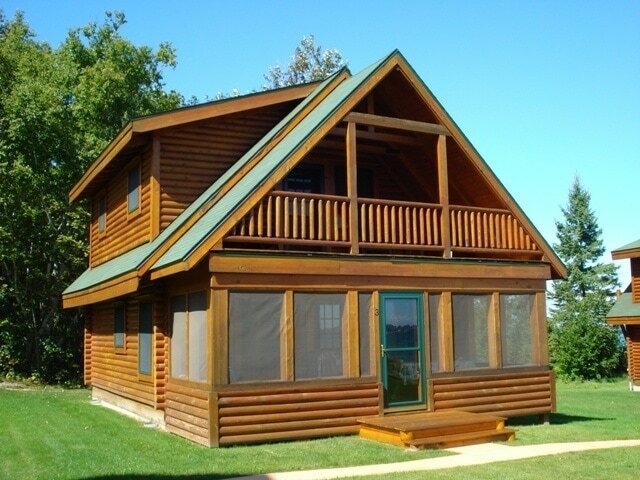 Birch Lodge Cabin #2 has 2 bedrooms, 1.5 baths and sleeps 4. Just a few short steps from Lake Huron, it is one of five cabins at the Birch Lodge. A short drive to Mackinaw City or Cheboygan. Two-story cabin with screened-in front porch and 2nd-story covered balcony. We have two cabins here that we rent. These cabins are very well kept and very clean—the perfect Up North getaway. A great area to travel in really any direction—see what each small town has to offer, or cross over the bridge and enjoy the UP area of Michigan along with Mackinaw Island. Right across the road is the Midland to Mackinaw Trail. Great for riding bikes or walking. This cabin is cozy and inviting—it will be a truly enjoyable vacation …one you will want to experience year after year. For larger groups, we have 2 cabins here to rent—just ask us about the other cabin. We have housing for up to 8 people with both cabins rented. $1300.00 weekly.